For better or worse I've was always in a rush to get married. I get that it's not really very politically correct to see marriage as an end, and what not, and marriage for marriage's sake isn't a great goal, but I just always had this idea that I'd be really good at marriage and that marriage would be good for me. I didn't really worry about the wedding much (and my eventual wedding was pretty understated as such things go), and dating always seemed like a strange proposition to me, but I was on the hunt for "Mr. Right" from a very young age. And I found him at a very young age, but didn't "land" him until several years later, but that's a long story. . . The shorter version is after falling deeply in love with a good friend who told me I was like a "little sister to him" when I confessed my feelings (then ran off to the Marine Corp to escape me because apparently terrorists were less intimidating to him than I was . . . well, that and he had some sort of drive to serve his country or something like that. ), I felt a little lost through my late teens. 16-year-old me had fallen in love and tried to manage it, hoping maybe he'd come around. 18-year-old me took a leap of faith and confessed her long carried feelings only to receive a disappointing response. 19-year-old me tried to figure out what to do with her life even though she couldn't stop pining for a man who was obviously NOT interested and no longer even lived in the same state as her. And 20-year-old me wrote a book about love. I was always writing, but this book came really naturally to me. I wrote about a hero who was what I wanted in a man, a friend, honorable, protective without being overbearing, someone who I could spend my life with quite happily . . . and he sort of still looked and acted like my high school crush turned distant Marine, but I was okay with that. I wrote it in terms of knights and princesses and presented other potential "prince charmings" to my princess to illustrate what I didn't want in a man (romantic but insincere or cowardly and impractical) and I wrote the love story I wanted to live. A couple months after I wrote "The End" on this work of escapism/hope (a few weeks before my 21st birthday), a young Marine came back into town on leave. I sent him an email asking if he wanted to get coffee and catch up. Coffee stretched out for longer than I'd dared to hope, leading me to invite him to a group Bible study the next day, and after Bible study, he told me he wanted to talk to my dad about courting me. That was about nine years ago. We've been married for eight, have two daughters, and marriage is pretty awesome. Matt's my best friend. He makes me smile and laugh. He's reliable, dependable, and sweet (when he wants to be). I always feel like I captured the knight from my story, somehow wrote him into existence. 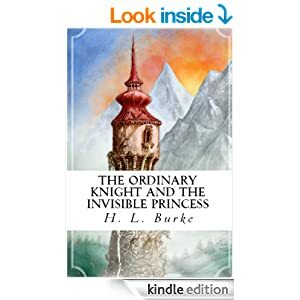 And that is why, even though I've written better structured and more commercially viable books since "The Ordinary Knight" still has a special place in my heart. So as a Valentine's gift to my readers I'm making "The Ordinary Knight" and its companion piece "The Invisible Princess" (which deals with romance but also with self-image) free for a few days. From 2/13-2/17 you'll be able to pick up the book for free on Amazon Kindle.